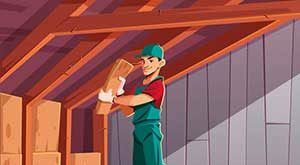 If you work in the logging industry, you’re constantly faced with a barrage of workplace hazards. Not only are you out in the wilderness dealing with the trials of Mother Nature, but you’re also dealing with potentially dangerous machinery. Whether you’re scaling the tallest tree or navigating a dense forest by foot in search for the perfect tree to cut down, it’s important that you stay protected. 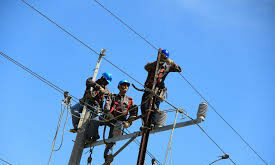 One of the most important pieces of safety gear you can invest in is a great pair of work boots. 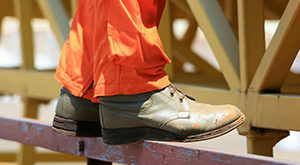 Your boots will keep your feet and toes safe from the dangers of your work environment while keeping you comfortable. They’re an integral part of the uniform that can save you from a lot of aches and pains when you clock out. To help you on your search, here are 7 of the best work boots for loggers. Made specifically for loggers, these boots from Danner contain a number of unique comfort and safety features. The most noticeable is a high heel. It’s approximately 2.25-inches tall to help you get through tough terrain. The outside of the boots are made from waterproof oiled nubuck leather. It also has a high shaft that rises 9 inches from arch to keep you protected even if you have to walk through deep water or muck. 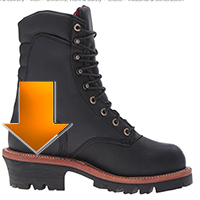 The bottom of the boots features a deep tread design to give you better traction. There’s also a lightweight board built into the sole to keep your heel rigid while providing flexibility in your forefoot. These boots can keep you protected in a wide variety of weather conditions. The uppers are made from durable waterproof leather. 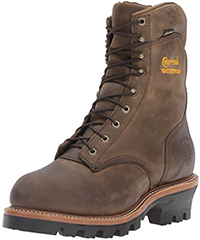 The boots also use Goodyear welt construction to attach the outsole, effectively creating a tight seal against water penetration. The high 9-inch shaft prevents water from getting in at the ankle. There’s also a Chip-Tex waterproof membrane. It acts as a second layer of defense. It’s also breathable to keep your feet ventilated. The inside of the boots features a Dri-Lex moisture-wicking lining and Thinsulate to battle the cold. The outsole is made of synthetic rubber and is designed to be resistant to slips and oil. 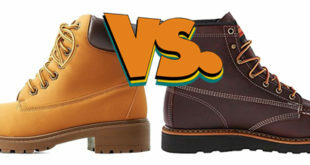 These boots from Timberland are designed with your cutting tools in mind. To keep the bottom of your feet safe, the sole has a puncture-resistant plate. 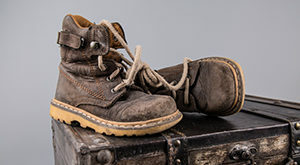 The uppers utilize Ever-Guard leather, which is designed to be resistant to abrasive damage and tears. It’s also waterproof for added protection. Inside the boots is Timberland’s Anti-Fatigue technology. The insoles are contoured to provide you with support. They also help to absorb the shock on your feet and redirect that energy to key points to improve your rebound with each step. 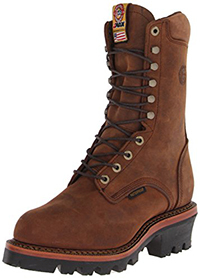 The boots feature a high 9-inch shaft for ankle protection and a 1-inch heel for better traction. If you’re worried about ankle protection or water penetration from the top of your feet, these boots are a great option. They have a significantly high shaft that measures 11 inches from the arch. The uppers are clad in 100% leather. The overall design is waterproof and the boots come with Dri-Lex lining inside. Bootie construction also gives you another layer of comfort and protection as you work. The heel has a moderate height of 1 inch. The bottom of the boots features deep grooves and spikes. This design can help to channel mud and water away so that you have a better grip on the dirt below. Another great option from Timberland, these boots feature plenty of waterproofing features and protection from accidents. 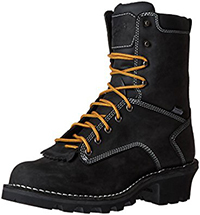 They have a durable mechanically bonded steel toe. It has the signature TiTAN shape to provide a better fit and great protection. The uppers are made from leather and extend 8.5 inches from the arch. They’re also designed to be resistant to abrasive damage. The boots utilize a waterproof design, welt construction, and a membrane. There’s also a mesh antimicrobial lining to keep your feet ventilated. The rubber sole has a 1-inch heel. There’s also great traction to make the boots slip-resistant and oil-resistant. From Wolverine, these boots are great for loggers that need to keep warm. They feature 400-gram Thinsulate to provide ample warmth in colder temperatures without adding significant bulk. The uppers are made from 100% leather. Goodyear welt construction is used to attach the Vibram sole. This unique sole has rubber lugs to improve grip in any condition. A steel shank is included for support. In addition to the Thinsulate, the inside features breathable Gore-Tex lining. It can help keep water out while letting fresh air in. There’s also a removable insole. It’s fully cushioned to support your feet as you work. 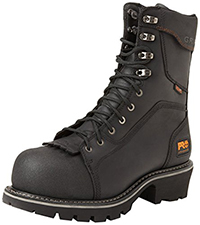 With its high shaft and prominent heel,these boots are great for loggers. The shaft rises approximately 8 inches up from the arch and utilizes laces throughout to get a custom fit. It’s made from an attractive Apache leather. The material is durable but soft enough to flex a bit as you move. 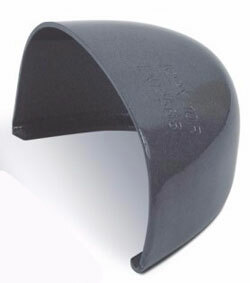 To keep your toes protected, a steel cap is also included. The sole is made from a synthetic material. Inside, the boots have a drill vamp lining for comfort and easy maintenance. There’s also a 5 iron Texon insole. It’s considerably thick and rigid enough to provide you with lasting support as you work. While there are a number of great work boots on the market, standard options just won’t do. 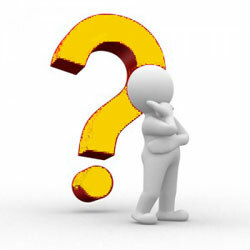 You need to choose boots that are catered to the specific issues you’ll be faced with as you work. The best boots for loggers with have built-in features to keep you comfortable, stable, safe, and prepared for whatever work may throw at you. This is a commonly overlooked safety feature among loggers because many think that slip resistance is only something you have to worry about on smooth surfaces. However, it’s good to have a little extra traction even when you’re on location. When it rains, the mud and vegetation will become very slippery. Furthermore, you’ll be around a lot of oil from your machinery and sap from the trees you’re cutting down. It’s best to get a pair of boots that have a sole built for gripping the earth. Look out for unique designs on the outsole. Slip-resistance soles are specially designed to redirect water and improve contact with a solid surface regardless of where you’re standing. The higher the treads, the better your boots will be in inclement weather conditions. Having a taller heel can provide you with additional traction and protection on uneven terrains. 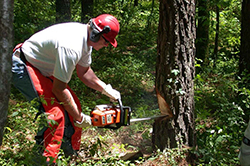 Loggers often venture into unknown environments. You’ll be going over tough terrain that’s bumpy, sloped, and full of debris. Usually, the heel is the first part of the foot that makes contact with the ground when you’re easing into unfamiliar territory. Having a thicker heel will keep your foot protected if you step on something sharp. Furthermore, that extra height will give you more stability as you make your way through uneven grounds. As you make your way through the work site, be prepared to step into some mud and water. Many logging sites are damp and riddled with puddles. If it’s just finished raining, the problem is even worse. To avoid that uncomfortable wet feeling in your socks, look out for a waterproof build. The uppers should be made from a high-quality waterproof leather and have a high shaft that extends beyond the ankles. The connection point between the uppers and the heel should also be sealed. Pay attention to the seams of the boots and make sure that everything is water-tight. Waterproof construction can save your feet from discomfort, bacterial growth, blisters, and much more. Because logging sites are different around the country, it’s a good idea to match your boots to your environment. If you’re working in a colder environment that frequently snows, go with boots that offer insulation. Insulation will keep your feet warm throughout the day. Thinsulate is a great option that can keep you cozy without the added bulk that often comes with thicker alternatives. If you work in the scorching sun, you’ll want to invest in something that’s breathable. Unique designs will help to promote airflow to keep your feet dry, wick away sweat, and keep the odors at bay. Contrary to popular belief, boots can be breathable and waterproof at the same time. Special linings and membranes will keep your boot sealed without sacrificing ventilation. One such option is the Gortex lining. The shank refers to a thin piece of steel that’s embedded into the sole of your boots. It’s typically located just below the arch and helps to keep your feet supported through any type of terrain. It’s sturdy enough to keep your arch up but springy enough to absorb some of that shock you may feel as you make your way through the terrain. Having a steel shank can help you prevent foot pain throughout the day and long after you get off. If a piece of stray timber falls on your toe, you’ll be thankful that you invested in a strong toe cap. Steel toe caps go over all of your toes to create an effective shield against fall damage. They can provide varying levels of protection, but most are designed to keep you safe from objects that weigh at least 75 pounds. The cap can also keep you safe from the gear and tools you’re handling. Last, but certainly not least, you’ll want to pay attention to the comfort features your boots have. There are a number of high-quality safety features you can go with. The most important are cushioned footbeds and shock-absorbing midsoles. It’s a good idea to go with something that’s anatomically molded to place your feet in the right position. Your arch should be supported at all times to prevent serious injuries and pain. A cushioned footbed can also help to absorb the force of impact as you walk. While it may not seem like a huge difference at first, these features are designed to prevent long-term damage and pain after you’ve gone home for the day.